From the 1800s to the present, Cody, Wyoming has stood for and still stands for the Old West and adventures in outdoor recreation, attracting visitors and new residents alike. Colonel William F. Cody (Buffalo Bill) first came to the Big Horn Basin of Wyoming with a distinguished geologist to make a study of the natural resources in the area. Because of the many possibilities for development of this wonderful land, Colonel Cody comes back to the region after a long absence. The Cody establishes the TE Ranch as an effort to irrigate over 100,000 acres of land near what is now Cody. The ranch house was the headquarters of the Shoshone Land and Irrigation Company. Cody, Wyoming was established by “Buffalo Bill Cody,” along with his group of investors. Colonel Cody created the newspaper, The Cody Enterprise, and was spending money for irrigation and other various projects in Wyoming. Cody, Wyoming was incorporated, and the Irma Hotel (named after Colonel Cody’s youngest daughter) was opened. The Cody Stampede and Rodeo was established. This year on July 4th saw the dedication of the Buffalo Bill Memorial Association, which included the Gertrude Whitney sculpture of “The Scout,” Colonel Cody. The Buffalo Bill Museum opens on July 4th. The Whitney Gallery of Western Art is dedicated. Cody, Wyoming is a popular tourist destination, and known as the Rodeo Capital of the World. Every year the Buffalo Bill Cody Stampede is held with contests and games and much spectacle in this wonderful town of the Old West. The Western Heritage Center is located in Billings, Montana. The Dancing Bear Folk Center encorages knowledge of the past, enjoyment of the present, and the passing on of traditions into the future. 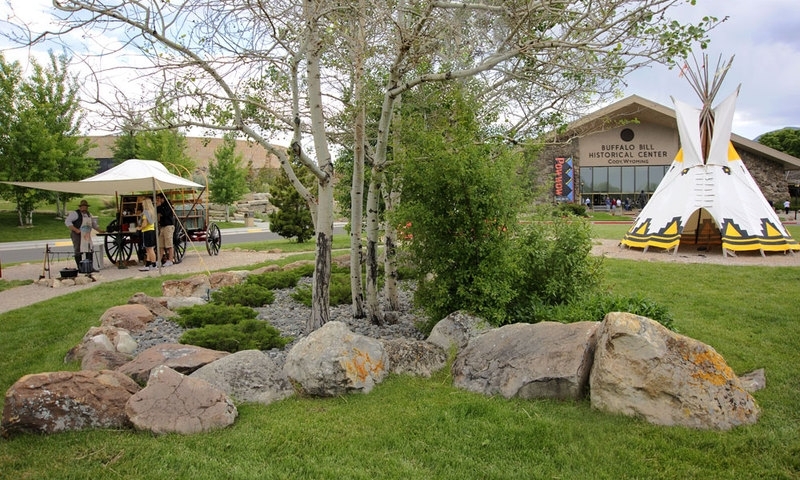 The town square in Jackson Hole, Wyoming is part of Wyoming's Wild West heritage.